Her Baby Died During Birth, Two Hours Later, He's Alive! It was a final chance to say goodbye for grieving mother Kate Ogg after doctors gave up hope of saving her premature baby. She tearfully told her lifeless son – born at 27 weeks weighing 2lb – how much she loved him and cuddled him tightly, not wanting to let him go. 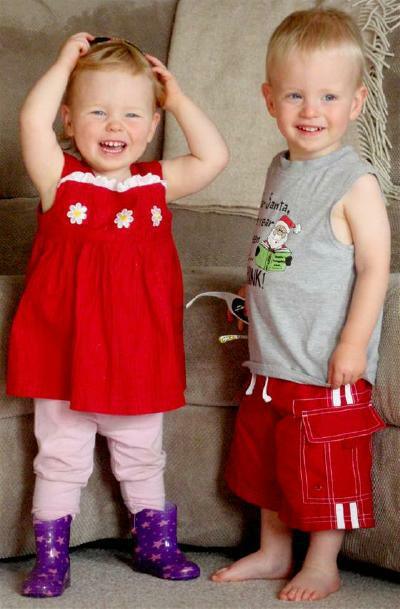 Although little Jamie’s twin sister Emily had been delivered successfully, doctors had given Mrs Ogg the news all mothers dread – that after 20 minutes of battling to get her son to breathe, they had declared him dead. Having given up on a miracle, Mrs Ogg unwrapped the baby from his blanket and held him against her skin. And then an extraordinary thing happened. After two hours of being hugged, touched and spoken to by his mother, the little boy began showing signs of life. At first, it was just a gasp for air that was dismissed by doctors as a reflex action. But then the startled mother fed him a little breast milk on her finger and he started breathing normally. The Australian mother spoke publicly for the first time yesterday to highlight the importance of skin-on-skin care for sick babies, which is being used at an increasing number of British hospitals. In most cases, babies are rushed off to intensive care if there is a serious problem during the birth. 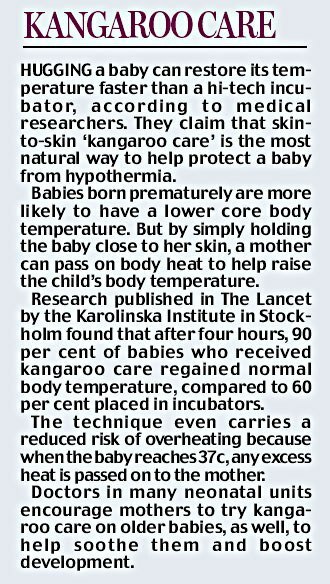 But the ‘kangaroo care’ technique, named after the way kangaroos hold their young in a pouch next to their bodies, allows the mother to act as a human incubator to keep babies warm, stimulated and fed. Pre-term and low birth-weight babies treated with the skin-to-skin method have also been shown to have lower infection rates, less severe illness, improved sleep patterns and are at reduced risk of hypothermia. Mrs Ogg and her husband David told how doctors gave up on saving their son after a three-hour labour in a Sydney hospital in March. ‘The doctor asked me had we chosen a name for our son,’ said Mrs Ogg. ‘I said, “Jamie”, and he turned around with my son already wrapped up and said, “We’ve lost Jamie, he didn’t make it, sorry”. ‘It was the worse feeling I’ve ever felt. I unwrapped Jamie from his blanket. He was very limp. ‘I took my gown off and arranged him on my chest with his head over my arm and just held him. He wasn’t moving at all and we just started talking to him. ‘We told him what his name was and that he had a sister. We told him the things we wanted to do with him throughout his life. ‘Jamie occasionally gasped for air, which doctors said was a reflex action. But then I felt him move as if he were startled, then he started gasping more and more regularly.